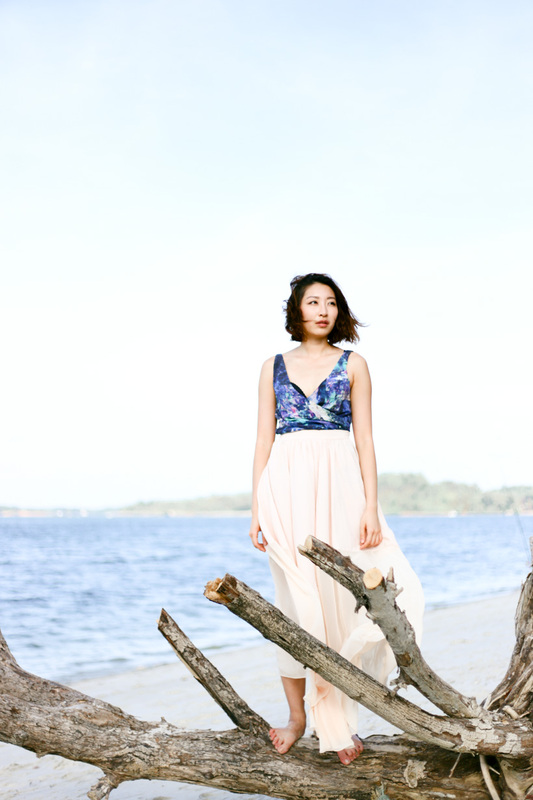 I have always wanted to shoot at Punggol Beach of Singapore - it's probably the only beach with interesting "props" to explore, such as rocks and big tree branches washed ashore. I love the romanticism of wearing a long flowy maxi skirt on the beach and this one I'm wearing is a pretty old piece I have in my wardrobe for some time already. I paired the long maxi with a crop blouse from Talulah - I love this collection thanks to its kaleidoscope like rainbow colors. Try to use your camera on Manual mode - Doing so would avoid your camera from underexposing your photos if it was on Auto. You can set you ISO to 100 or max 200 and then play at it from there. Tell your camera where you want to focus, and try to find interesting backdrops along the beach to shoot, such that not all of your photos will look the same. It helps if you do beach photography either early or late in the day, to get the best light possible. Make sure your camera lens come with an UV filter, which will help to block short length UV light, or have a polarising filter on to darken the sky. It really depends on you to achieve an interesting effect.